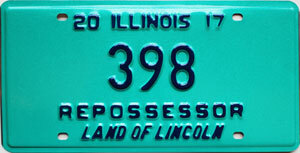 A 2017 Illinois Repossessor license plate # 398, in good condition as pictured. This license plate is hard to find. Get it before it is gone !